Firefox 66 is the upcoming stable version of the web browser by Mozilla. The version is currently in the Beta channel and will be moved to Stable on March 19, 2019 according to the release schedule. Firefox 66 incorporates several extensions related changes. One of them changes how extensions use local storage. Extensions in Firefox use JSON files for that currently: starting with Firefox 66, extensions will use IndexedDB instead. 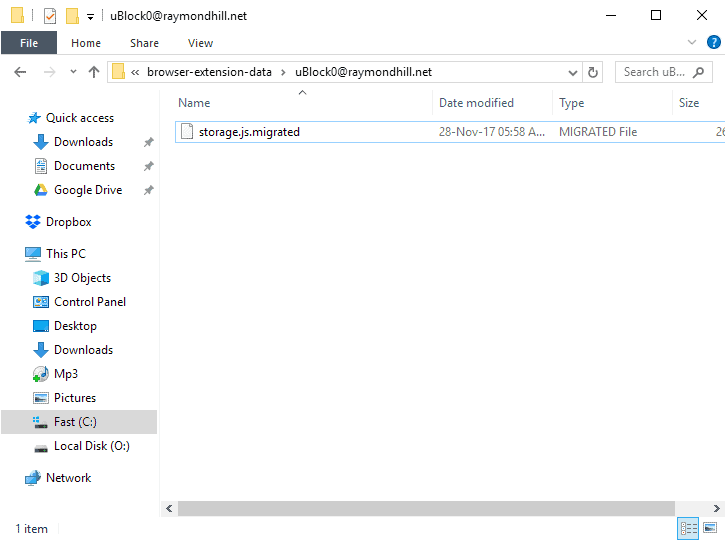 Good news is that the migration happens automatically; developers don’t need to change extension code and storage used by extensions already installed in pre-Firefox 66 versions will be migrated to the new storage format when the update happens as well. Note: It is recommended that you back up Firefox before you make the change as it is not clear right now whether it will be possible to downgrade the browser after the upgrade. If there is any chance for a downgrade, back up Firefox. Mozilla does not delete the old storage files but adds .migrated to the filenames. You find them in the browser-extension-date folder of the Firefox profile. The change to IndexedDB is beneficial to performance and memory usage according to Mozilla. This results in a significant performance improvement for many extensions, while simultaneously reducing the amount of memory that Firefox uses. Extensions that store “small changes to large structures” benefit highly from the change; many ad-blockers do so according to Mozilla. Mozilla’s Luca Greco created a short video that demonstrates how beneficial the change is in regards to performance. The video is silent, unfortunately, and it is a bit difficult to understand what is going on. Focus on the startup performance of the Firefox web browser. You will notice that the browser loads the test site a lot faster in Firefox 66 (with an ad-blocker installed) than previously. Whether you will see an improvement depends largely on the installed extensions. If they do use local storage and make lots of smaller changes, you may see noticeable improvements. Firefox 66 comes with another memory improvement related to extensions. Extensions that load objects from storage to memory use less memory than before thanks to an improvement implementation. Firefox users who run Beta or Nightly versions of the web browser should see the benefits of the new implementation already. Now You: What is your general take on Firefox performance? Ghacks needs you. You can find out how to support us here or support the site directly by becoming a Patreon. Thank you for being a Ghacks reader. The post Firefox Extensions to use different storage type in Firefox 66 appeared first on gHacks Technology News.